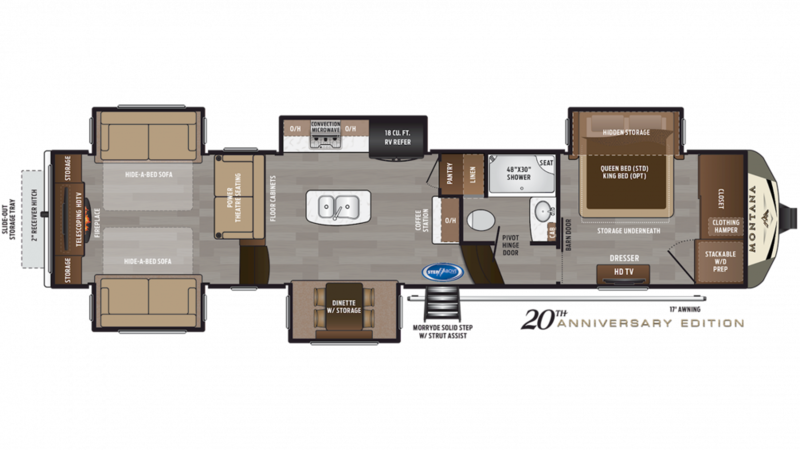 Experience family togetherness like never before in the 2019 Keystone Montana 3790RD! Here at Lakeshore RV Center, we want all of our customers to make family memories! What better way to do that than in a 2019 5th Wheel! We strive for customer satisfaction and want to help you along every step of the way; from searching, to purchasing, with great service after the sale! Lakeshore RV Center guarantees the lowest price in the nation, so stop on by the #1 Michigan RV Dealer and save on your dream Montana today! Don't hesitate to give us a call at 231-788-2040 if you have any questions! We'd love to help! In Muskegon or passing through? Visit us at 4500 E Apple Ave Muskegon Michigan 49442 and let us help you get started on making your RV dreams come true! Towing this 5th Wheel is not an issue, with its hitch weight of 2600 lbs, dry weight of 13755 lbs, and GVWR of 16600 lbs. Enjoy some much-needed shade outside with the 17' 0" awning! Ample room is found inside this 40' 4" long and 8' 0" wide 5th Wheel. With this 13' 4" tall Montana, it's easy to walk in its spacious living area. By sliding out the 5 slides, the RV becomes even more spacious. Even when the weather isn't cooperating, you'll stay comfortable inside with the 35000 BTU furnace and the 15000 BTU a/c unit! There's no place like home - except for this cozy RV! It can sleep up to 6 people, and the master bedroom's Queen bed rivals the one at home! The kitchen is full of modern cooking appliances, so you can whip up healthy, hearty meals whenever you please! Store your fresh produce, meats, and drinks in the 18.00 cu. ft. refrigerator, and sizzle up savory dishes on the 3 burner range cooktop! Fill up the 66 gallon freshwater tank for loads of clean water to cook, drink, and clean with on your trip! This RV has a 88 gallon gray water tank and a 49 gallon black water tank, so you won't need to look at or smell your dirty water water and waste while on vacation! Inside the bathroom you'll find a Porcelain Foot Flush toilet and a shower, and since there is 60 lbs. of LP tank capacity, the shower stays hot for longer periods of time! Gather around the beautiful fireplace that comes with this handsome RV! Watch the flames dance and feel cozy and comfortable inside, even when it's cold outside!